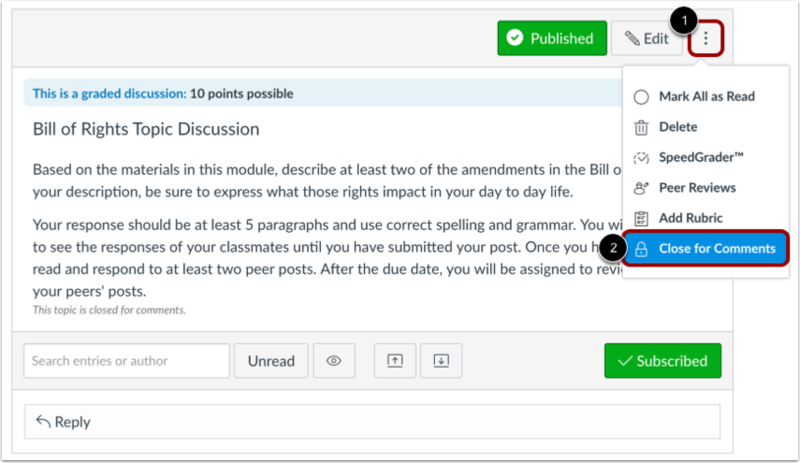 To manually stop students from posting replies to discussion posts, you can use the Close for Comments option. You can automatically set your post to close for comments on a specific date by creating discussion availability dates. 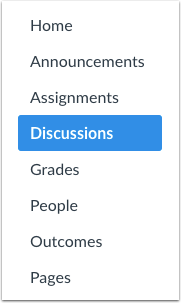 For graded discussions, the Close for Comments option will not appear until after the discussion due date. To close a discussion from the index page, locate the discussion. Click the Options icon  and click the Close for Comments link . To open a discussion for comments, locate the Closed for Comments section. Locate the discussion and click the Options icon , then click the Open for Comments link . To close comments within an individual discussion, click the title of the discussion. Click the Options icon , then click the Close for Comments link . To open a discussion for comments, click the Options icon  and click the Open for Comments link . Previous Topic:How do I allow students to edit and delete their own discussion posts in a course? Next Topic:How do I set up a graded discussion to be sent to my institution's student information system (SIS)? Table of Contents > Discussions > How do I close a discussion for comments in a course? Re: How do I open discussion for comments? Re: Discussions: Closed, Locked, Unpublished...WHY?